Motivational speakers might tell you to set small, achievable personal milestones on the way to completing a larger goal – like a marathon runner who focuses solely on the next mile marker en route to completing the race. Marketers and online retailers often apply the same approach to their attribution models and conversion funnels. Just nudge the consumer on to the next step and they’ll be that much closer to becoming your customer. We divvy up the entire process into bite-sized goals and presume that our site visitors will march down that funnel in a smooth, predictable way. Occasionally, this is how consumers behave. A visitor who needs a birthday gift sent ASAP may not care about comparison shopping, shipping rates, customer reviews, discount codes, and so on. They’re on your site to find a suitable product and breeze through your checkout funnel 1-2-3. Those visitors sprint to the finish line and make everything seem so simple and straightforward. They’re also increasingly a rare breed of online shopper. In other words, most online shoppers are more akin to a hiker than a marathon runner. Both hiker and marathoner have an end goal in mind, but along the way, the hiker may spontaneously stop at a creek and jump in, take a side trail to a grand view, watch wildlife, and so on. The marathoner stays on course; the hiker meanders. The hiker, in a nutshell, is the face of online shoppers in 2017. Even the 8% who do intend to complete a purchase on their first visit may still decide to check prices (particularly on Amazon), look at other alternatives or accessories, or leave to find a discount code. Some might decide to wait til payday. Others might just get distracted by their surroundings and forget to complete checkout. A thousand things can occur between initial engagement and conversion completion and few of them are within your control to avoid. So maybe it’s time to start thinking of the customer journey as less of a funnel and more as an elaborate maze. What would it look like if we replaced the traditional idea of a conversion funnel with a more realistic customer journey? Despite an increasingly complex customer journey, turning visitors into shoppers and shoppers into customers is still an attainable goal for retailers who are willing to reach the consumer throughout their journey. That involves re-distracting them back to your site once they’ve left to scroll through Instagram, watch cat videos, or read an article on the latest Trump White House debacle. I am, of course, speaking about Remarketing, but not traditional ‘set it and forget it’ Remarketing. Showing a recent visitor or cart abandoner a generic ad about your brand does little to recapture their attention or increase their sense of urgency. If a consumer leaves to price check or decides to wait before making a purchase, they won’t be swayed back by a simple brand message. For example, here are 4 potential remarketing opportunities and 2 potential site improvements a retailer could take advantage of to ensure our hypothetical distracted consumer above stays “in the funnel”. As big-picture digital marketing becomes increasingly personalized and focused on user intent, your own efforts should strive for a similar approach. You know that your visitors will compare prices and look for discounts elsewhere – why not meet them there and reassure them that you’re offering the best prices or best value they’ll find? You know your visitors will be distracted by social media, why not meet them there with ads relevant to their interests or the types of products they browsed? And once you have them in the checkout process, make it as simple and convenient as possible to complete the transaction! 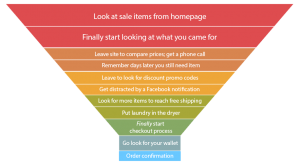 The traditional Conversion Funnel is a great tool for identifying annoying pain points in your Checkout Process and making it as simple as possible for the “marathon” type shoppers to convert, but don’t ignore the unique needs and behaviors of the “hikers”. With a simple understanding of your shopper’s behavior beyond your website and a comprehensive strategy to meet them on their path and guide them back to the finish line, you can convert those meandering hikers. Anvil can help – call us to discuss your current marketing strategy and find out where your shoppers are getting lost.